BuckBilly posted a topic in General Talk - Anything Goes! Good morning to all !!!!!!!!!!!!!!!!!!!!!!!!!!!!!!!!!!!!! Let's see if we can make this a daily event. zippy posted a topic in New Members Area! Hi congrats on a great site. What's a good light helmet? 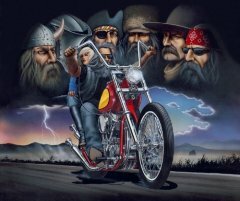 Really don't like the idea of wearing a helmet but for safety's sake I cant justify flying down a dirt road at 45 without wearing one, so I'm wondering what's a good helmet to get for someone who doesn't want a helmet on at all. Light weight would be a priority as well as open face. Good after noon everyone, new here and really sure how to post anythang or get back to the topic I was lookn for so maybe u quad fans can help me out. I've got a 300 king quad that I really need info on. It's drivin me nuts . It starts and idles great but when I give it gas it spits and sputters. 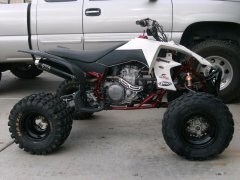 Anyone that could help me get lined out on this forum and my old quad u be a blessing . Nice day today, unglued the computer tablets from my kids faces and hit Knik river. My new 09 King Quad 450 on the right. Vintage 280 KQ hand me downs there after. Think I have my new avatar. My wife got me a winch during the black friday sell I hope to get it mounted tomarrow. We've had lots of rain so I might get a chance to try it out If i get it installed. I took the old prairie out and had some fun but it was hot today so I cut my ride time down. Came home and was going to rest I knew I should have came in the house & not stay in the garage. Now the xr100's motor is out of the bike and the top end is apart. Had to go get a few parts for the bike so my daughter was checking out the new quads! We looked at the Raptor 250 & 700 then a Polaris 200 she said the 200 would be ok. Then she picked 1 without any adult input. Santa is to poor but the winner was the Polaris 850 with camo body It broke my heart when she said no to the BF750. I found this and thought it would be of interest to some members ... Don’t Let it Happen to You A few short years ago the off-road world was enamored with 2-strokes thanks to their reputed simplicity and performance. Then, seemingly overnight, the four-stroke mill resurfaced and has since taken over nearly every aspect of the performance-quad segment. To many long-time 2-stoke devotees, the concept of valves, cam chains, and wide, flat pistons threw them for a loop. There is no denying the reality that more moving parts equals higher rebuild costs, but there’s no reason to forget everything you’ve learned throughout the years in diagnosing a tired engine as a result. The following report is designed to shed some light on what to look for specifically if you’re uncertain whether or not it’s time for a four-stroke rebuild. Remember that it’ll save you money if you catch the problem before it actually fails. A Game of Hours If you just brought home your new ATV, take advantage of the fact that it’s yet unridden and pick up an hour meter. If that’s beyond your means, keep a log of time spent in the saddle. There’s no more an accurate means of determining when you’re due for a rebuild then by keeping track of the hours on the motor. Your ATV’s owner’s manual will provide intervals (usually on the conservative side) as to how often you should be freshening up the internals. Keep in mind that racing will speed up wear while gentle trail riding will extend service life. Condition Induced Guilt In keeping with the first entry, be honest with yourself (even if the hour meter says you’re still in the good zone). Have you been neglecting oil changes or racing with caked on mud? Have you flogged your quad in the sand/dust? Have you let air filter maintenance slide or ran the ATV without realizing it was low on coolant? These are all factors that can greatly accelerate time between rebuilds. Lend Me Your Ear Especially detectable at idle (beneath the rumble of the exhaust note); listen for clunking, thumping, or rattling sounds in the top-end. This is especially important if a sound you don’t remember hearing before suddenly pops up during a ride. Remember that not all four-stroke noises mean catastrophe: A loose flywheel or stretched cam chain are common culprits to the rattles. However, in either case, tightening down or replacing the worn bits can avert a full-on engine failure. Compression Depression Sorry to break it to you, but that old compression gauge that told you when the piston in your 2-smoke was due for a replacement doesn’t work on a modern four-stroke. This one has become a shop specialty, as most will have a leak-down tester capable of measuring static compression. Read Your Oil In the modern four-stroke, there are few indicators as valuable or as accurate as reading the lubrication-fluid that had just spent time circulating among the engine’s internals. If you’re suddenly spotting excessive debris in the bottom of the oil pan after a change it could very well indicate trouble. Also smell the oil being drained (even if it still looks fairly clean). If it smells burnt or like fried-clutch, it may be time to freshen things up. Clearance Items It turns out the manufacturers don’t provide the clearances of certain engine components just to be fancy. By checking these numbers, you can easily tell if things have worked themselves out of whack. Begin with valve lash and work your way into the internals with piston ring end gap, skirt clearance, and rod and valve guides. Hard Starting Four-stroke engines will often let you know something’s wrong a little bit before a full meltdown by refusing to fire up. If your quad suddenly seems harder to start or requires much more cranking than usual, take heed. Poor compression or improper valve clearance are often to blame. The Rest of the Quad If you’re still in the dark as to whether it’s time to consider a rebuild, take a look at the rest of your quad. Have you burned the knobs off the stock rear tires? Have you replaced the original brake pads yet? Is everything else in need of a refresher? A simple way to get a rough estimate as to how many hours are on the motor itself is to factor against the more-frequent maintenance performed. No Smoking Zone Yes it was perfectly natural to trail exhaust smoke in the 2-stroke days but if your four is puffing clouds, not a good sign! If your quad suddenly decides to take up the smoking habit, it’s possible the valves/ guide seals are starting to fail. Even more likely is that the piston rings have worn to the point where they no longer seal against the cylinder wall. WoooHoooo I got a 45 min. to an hour ride in with my wife on the back. Only real pain for my hand was the front brake. I still can't open twist off lids but I can ride. We even got a little muddy. 2 nights ago we had sleet & 50's yesterday & 60's today. I plan to ride tomarrow if my sinus clear up. I got a video of the ride I will post it later. It's good to be back on the quad. A lot of you know I had to buy a nonrunning quad to get a replacement frame for my prairie 650. I paid 300.00 today I sold all the left over parts for 200.00 The stuff was worth more than that I'm sure but at the same time I don't have too part it out and wait for buyers and shipping no ads no calls to deal with & I get all the stuff out of my way and get that part of my garage back. Another year off to a good start. Another sign that I am way to hyperactive. I was given the honor of being the January 2012 Goalie of the Month at SMALLSAVES.COM. Make sure to visit and check it out and feel free to comment. I met a new neighbor this evening he has a forman & a wamaha waptor he just got. So I might have a riding friend woo hooo!!! orangerider300 posted a topic in General Talk - Anything Goes! I am a die hard Brown Mtn. ridin fan and was wondering if any one from the NC??????? ?